The pride of Vancouver's network of parks and gardens, Stanley Park covers 1,000 acres (405 hectares) and is one of the largest parks in any urban centre in North America. Situated in the heart of Vancouver's densely populated West End, it stretches out on a peninsula and surrounded on three sides by water. Stanley Park is at once a refuge for visitors seeking a brief escape from the urban jungle, a showcase for the natural beauty that surrounds the city and an entertainment centre. The park is criss-crossed through its dense rainforest interior by miles of wide gravel paths surrounding Beaver Lake and Lost Lagoon. It is home to hundreds of migratory birds such as Canada geese, swans, and ducks, and large populations of racoons, squirrels, skunks, and coyotes. The park has a miniature railroad, putt-putt golf course, and an aquarium. 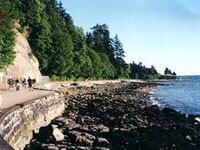 It is also possible to walk, jog, cycle, or rollerblade around the long seawall that encircles the perimeter.